Hosseinabadi*, T., Kobarfard, F., Mojab, F., Ghashghaee, D. (2017). Identification and determination of chemical compounds of five aromatic waters from Iran. Research Journal of Pharmacognosy, 4(Supplement), 86-86. T. Hosseinabadi*; F. Kobarfard; F. Mojab; D. Ghashghaee. "Identification and determination of chemical compounds of five aromatic waters from Iran". 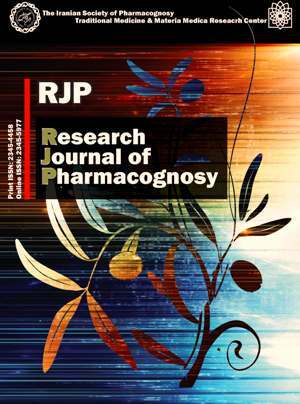 Research Journal of Pharmacognosy, 4, Supplement, 2017, 86-86. Hosseinabadi*, T., Kobarfard, F., Mojab, F., Ghashghaee, D. (2017). 'Identification and determination of chemical compounds of five aromatic waters from Iran', Research Journal of Pharmacognosy, 4(Supplement), pp. 86-86. Hosseinabadi*, T., Kobarfard, F., Mojab, F., Ghashghaee, D. Identification and determination of chemical compounds of five aromatic waters from Iran. Research Journal of Pharmacognosy, 2017; 4(Supplement): 86-86. 1Department of Pharmacognosy and Biotechnology, School of Pharmacy, Shahid Beheshti University of Medical Sciences, Tehran, Iran. 2Department Medicinal Chemistry, School of Pharmacy, Shahid Beheshti University of Medical Sciences, Tehran, Iran. Background and objectives: Herbal aromatic waters are one of the products used in the Iranian traditional medicine. These products have small amount of essential oil. The purpose of this study was to identify the effective substances of herbal aromatic waters by various techniques (GC/FID and GC/MS). It is hoped that with assessment of these compounds by mentioned techniques a suitable way could be found for standardization of the herbal aromatic waters. Methods: Four medicinal plants (Zataria multiflora, Fumaria parviflora, Rosa damascena, and Mentha spicata) and aromatic water of Salix aegyptiaca were purchased from Tehran and their aromatic waters were extracted by hydrodistillation. In the next step, the essential oils of these aromatic waters were extracted by n-hexane and injected into GC/FID and GC/MS and chemical compounds were identified. Also, the standard components (thymol, carvone and 2-phenylethanol) were injected to GC, separately and calibration curves were drawn. So, the content of the major components was calculated, carefully. Results: The results showed that the essential oil of F. parviflora contained more than 30 compounds. Its main compounds included carvacrol (16.7%) and dihydroactinidiolide (13.8%). The essential oil of Salix aegyptiaca had 27 different compounds including 1,4-dimethoxybenzene (33.3%) and heptacosane (28.1%). Z. multiflora, M. spicata and R. damascena essential oils contained thymol (0.065 mg/mL), carvone (0.01 mg/mL) and 2-phenylethanol (0.015 mg/mL), as the main component, respectively. Conclusion: These results can be helpful for standardization and quality control of aromatic waters used in Iran.